It appears that I have not been keeping up here as much as I’d like. This is not really like me at all, so shoot. Since the marathon, I’ve been totally, as they say, “flying by the seat of my pants,” and I generally don’t fire up the computer at home anymore. The downside of me finally having a smartphone is that it has eliminated the need to use computers as much. Despite the schedule, I’ve managed to keep up with my fitness routine. Besides the extra movement I get from all the walking between transit lines and during the mandatory hour-long lunch, I’ve been doing a little Insanity, elliptical trainer, weights (mostly of the upper-body nature), and running 3-4 days a week, usually for about 40-50 minutes. Yes, I’ve been running by time now, as I only have 55 minutes of gym time (yes, it’s that calculated) – plus, I usually opt for an indoor track over the treadmill. Said indoor track requires 14.5 laps/mi, and the air is pretty stale for most of the lap, though still more bearable than the treadmill for some reason. Also, for the most part, I’ve been working out Saturday and Sunday if time allows. One would think that all this activity has made me into a super-ripped person, but in order to keep up with everything, I think my lunches and dinners have grown in volume, and not always nutritious volume. As you can see on my sidebar, I have another marathon next month. Actually, it’s more like two months away, but it IS technically in the next calendar month. I’m not going to worry for a couple more weeks, when I assume the fitness I got from training for/running LA Marathon has faded. 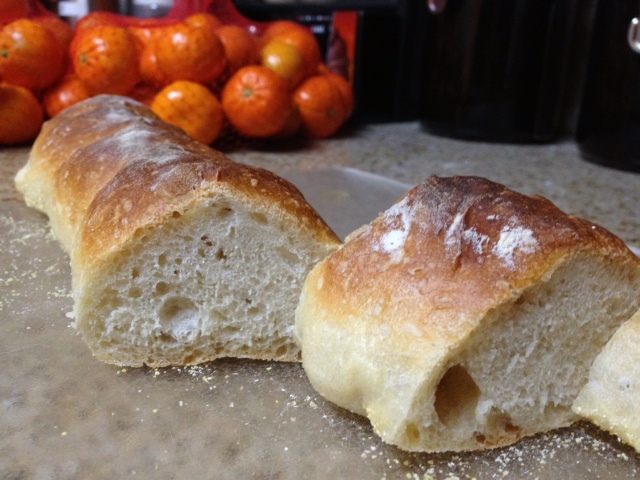 I randomly decided to make this bread recipe from Jacques Pepin, and I must say, it was pretty easy (albeit a bit long, waiting for rising)! “The Ukrainian” and I have also been pretty busy with “project get out of apartment.” Although I have to wake up pretty early now, the lead-footed folks upstairs always seem to wake up even earlier, weekends included, vacuums included. I haven’t really been out of town since November, when we went on our honeymoon. Summer is going to be super-busy at work, and my new-employee status means no vacations until Fall. Thankfully, I get a day off for my birthday, so we have a little getaway planned in a couple of weeks. On a related note, I remember feeling “old” when I was in my early 20s… looking back, I have no idea why I ever thought that. About to hit 28, married, calling a day off a “getaway,” getting excited about bread and monetary paperwork… yeah, now I really feel old. I’m sure I’ll take that back in the future, though.